In 2011, the company Chopard introduced the world to its new development that has brought us great success and recognition – known today, the manufacturing mechanism LUC 1.98 with four winding reels: a new technology called Quattro. However, the unique mechanism of self – development in 2010, in honor of the 150th anniversary of the brand. The unique mechanism is a patented design – the world’s only clock mechanism, which is equipped with four-winding drum connected to each other. Mechanism certified COSC – Swiss Institute for timekeeping, and was awarded the prestigious Poincon de Geneve, who speaks about his work and impeccable reliability. This year, Chopard is the international watch exhibition BaselWorld 2012 new watches LUC Quattro (Ref: 161926-5001), which operate on the basis of the manufactory caliber LUC 98.01-L, on the basis of 39 stones, with a frequency balance of 28,000 vibrations per hour, bridges, polished in the style of Cotes de Geneve. The mechanism is made using the technology of the famous Quattro, range – 9 days. Function: Display hours, minutes, seconds, date aperture, and power reserve indicator. Case diameter 43 mm model is made of 18 carat pink gold, thickness – 7.22 mm. 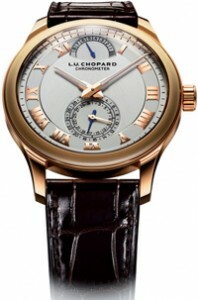 The crown is also made of rose gold with engraved logo LUC watch dial – silver colored satin. Temporary indexes – a golden color. Dial cover sapphire crystal with anti-reflective coating back cover – clear. The aperture of the date and small seconds located at position “6” hours. Water resistance of the model is 50 meters. Strap model is made of brown leather alligator manual handling, equipped with a buckle in 18 carat pink gold.